All accommodation and all meals (Until and unless specified). All Transportation by Toyota Qualis, Tavera or similar, Permits, Monument and Museum entry fees. Personal Expenses or Optional Tours / Extra Meals Ordered. Cost incidental to any change in the itinerary/ stay on account of flight cancellations, cancellation due to bad weather, ill health, roadblocks etc. Any thing not specifically mentioned under the head “Cost Includes”. For participants willing to fly into and out of Leh directly instead of the road travel from Manali , Please get in touch with us for details on travel dates and also changes in cost. Leh-Ladakh-Spiti tour involves moving in High Altitude Areas. Participants who have a medical history of Blood Pressure, Heart related problems or Asthma are advised to seek medical advice before enrolling for this expedition. Instruction on fitness aspects, medications and other must-need things to carry will be provided based on confirmation. 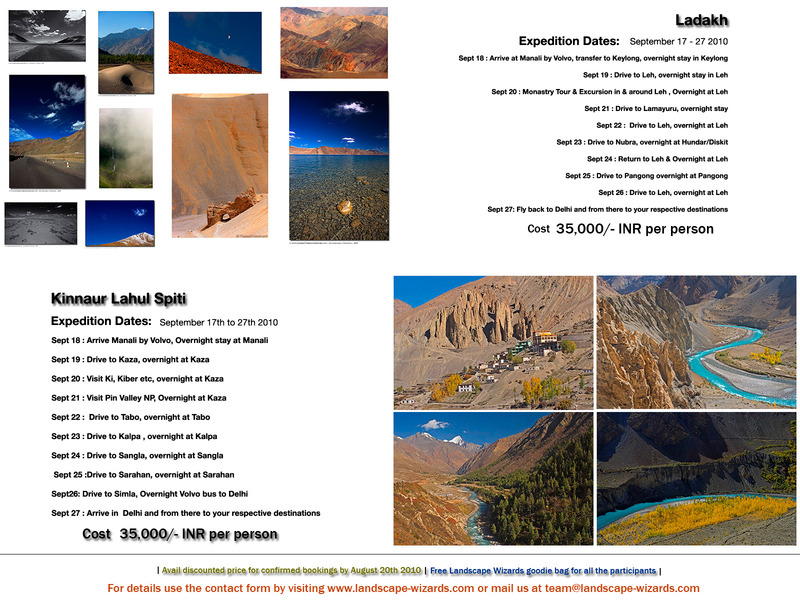 Disclaimer: This expedition is intended to be for Landscape photography oriented participants and hence no assurance with regard to Wildlife sightings in Ladakh is given. Non-photographers are also welcome to be a part of the expedition.